Join the Tompkins Chamber for our March Business After Hours at the Boyce Thompson Institute on March 13 from 5 - 7 pm. The event is co-hosted by Damiani Wine Cellars, Friedman Electric, and Serendipity Full Service Bar & Catering. Follow this map for free places to park on campus. Enter in the front lobby at BTI for registration, refreshments, and reception. Drop your business card at registration to win some fabulous prizes from our host, co-hosts, and Tompkins Chamber members. 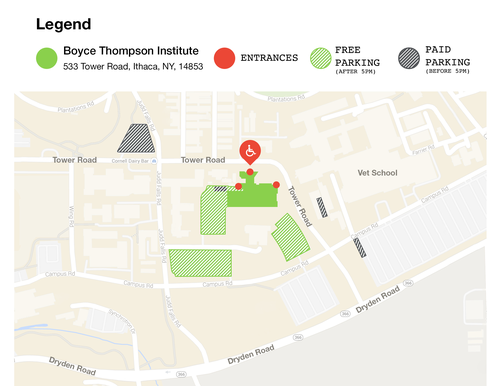 Follow this map for free places to park on campus.